Start your rental portfolio here with this cute two family offering new roof, heating system, two breaker boxes, and two hot water heaters. Nice two car detached garage, covered front porch, separate utilities, and appliance too. Close to Wegman's, Oakdale Mall, and city bus route. Johnson City Elementary Intermediate School Elementary School, High School / Public 3 1.72 mi. Johnson City Elementary Primary School Elementary School / Public N/A 1.72 mi. Johnson City Middle School Middle School / Public 4 1.72 mi. Johnson City Senior High School High School / Public 5 1.47 mi. Blessed Sacrament School * Pre-School, Elementary School / Private N/A 0.81 mi. St. James School * Pre-School, Elementary School / Private N/A 1.38 mi. 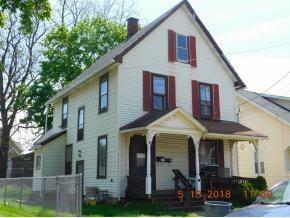 27 Camden Street, Johnson City, NY 13790 multi-family home was sold for $30,000. The multiple listing data appearing on this website, or contained in reports produced therefrom, is owned and copyrighted by Greater Binghamton Association of Realtors and is protected by all applicable copyright laws. Information provided is for viewer's personal non-commercial use and may not be used for any purpose other than to identify prospective properties the viewer may be interested in purchasing. All listing data, including but not limited to square footage and lot size is believed to be accurate, but the listing Agent, listing Broker and Binghamton Region Multiple Listing Service, Inc. and its affiliates do not warrant or guarantee such accuracy. The viewer should independently verify the listed data prior to making any decisions based on such information by personal inspection and/or contacting a real estate professional. Data Copyright 2019 Greater Binghamton Association of Realtors, Inc.